During the Summer of 1958, photographer Art Kane gathered 57 of the greatest Jazz Musicians in New York City to be a part of a photograph to be published in the January 1959 “Jazz” edition of Esquire Magazine. Although all jazz musicians were invited, Kane had no idea who, how many or if any musicians at all would show up as the shoot was going to be done around 10 a.m., not exactly a time most jazz musicians would typically be out of bed. To his surprise, they began to show up, one by one… by bus, cab and subway, fifty seven of the worlds greatest jazz musicians including Dizzy Gillespie, Thelonius Monk, Charles Mingus, Count Basie, Gerry Mulligan, Sonny Rollins and the great Lester Young. Through the years, this photograph and story have taken on a life of their own. It was also the basis of the recent Steven Speilberg/Tom Hanks movie “The Terminal”. 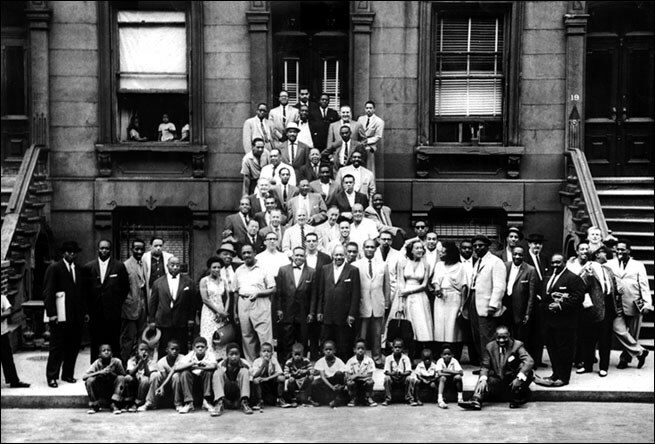 Known as “Harlem 1958” it is one of the most well known/most talked about photographs ever made of a group of jazz musicians. 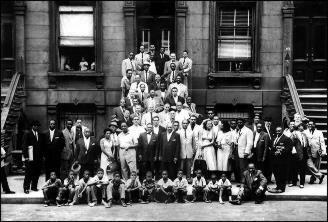 More about “Harlem 1958” and the amazing story/dvd/book entitled “A Great Day In Harlem” can be found here.